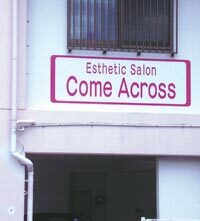 Alicia Morgan won a ¥5,000 gift coupon to Esthetic Salon Come Across. She same to Okinawa from South Carolina nine months ago, and says she loves it here. Read More! The arrival of warm weather has people shedding jackets and long pants, only to become concerned about unsightly hair being exposed. Come Across Esthetic Salon has specialists trained in removing unwanted hair. Read More! The martinis are shaken, not stirred, in the quiet ambience of the Motown Philly Soul Bar. The Ginowan watering hole is shaking things up next weekend with a Martini and Cosmopolitan Party. Read More!